Oppo I really do have an addiction. Yes, I have a car. Yes, I'm 16. Yes, I want another. This just showed up on my local CL. It is nonrunning but only $600. NPOCP? 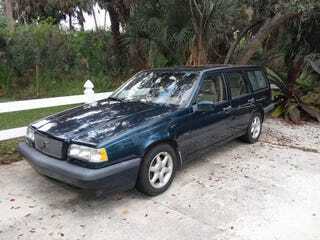 According to the ad, the Volvo needs a battery and has "some issue with the engine." However, the rest of the car is really clean. Look at the interior! It is spotless! This wagon really looks like nothing is wrong. Should I contact the seller? I really want a second car and I love this color. Plus, it looks like I could part it out and make all my money back. But what if the repair is really simple and I don't need to? Help me Oppo! Side note: How much would a simple tow cost so I could get this thing home? It is literally 5 miles away!